People called 911 about the one-year-old German Shepherd all night near the Loop 202 and SR-51. 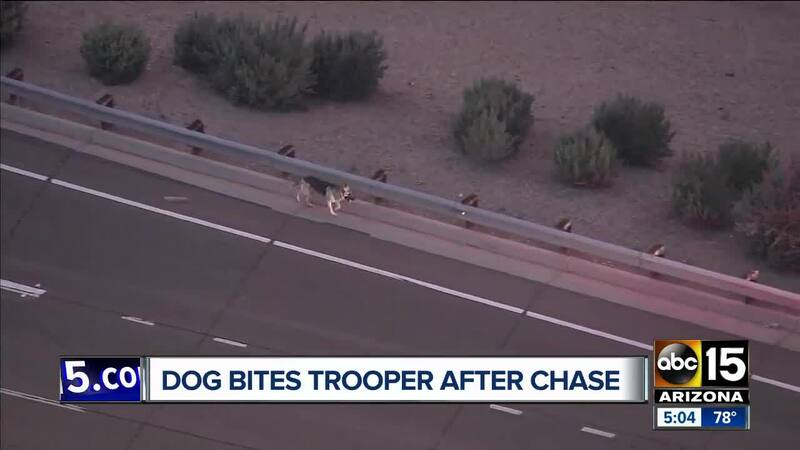 A German shepherd that snarled traffic as it loped on and off two Phoenix freeways during much of Tuesday morning's commute will be quarantined for 10 days after it bit a state trooper trying to grab its collar, officials said. The trooper is going to be OK after being bit on the hand while trying to secure the dog after that trooper or another used a stun gun to subdue the animal, said Trooper Kameron Lee, a Highway Patrol spokesman. A trooper then used a pole-mounted snare to restrain the dog, which was turned over to animal control. 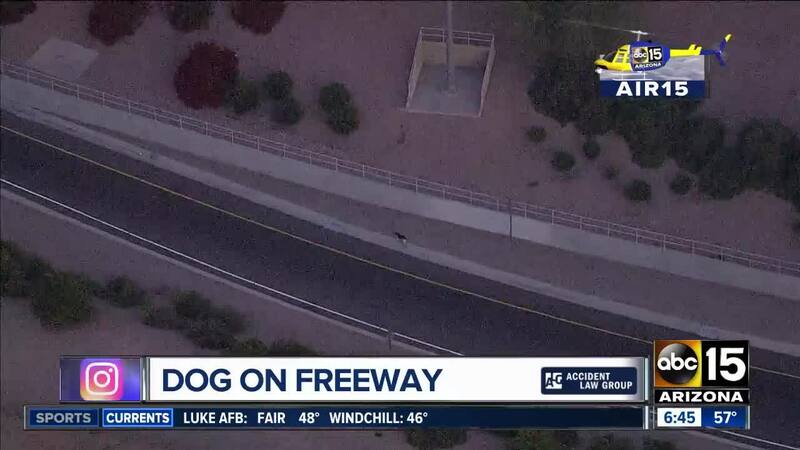 Lee said dispatchers got calls overnight about the dog being on at least one freeway and that efforts to remove it intensified when it began tying up morning traffic on State Routes 51 and 202. Troopers felt they needed to corral the dog to prevent wrecks, Lee said. "They thought it so bizarre that this dog is trying to get on the freeway." The dog at one point ran in and out of traffic on the carpool lane of State Route 51 before running into an adjacent neighborhood. It then turned up on nearby State Route 202, where traffic stopped as the dog evaded troopers and drivers, going under a truck at one point and evading a snare wielded by a trooper, Lee said. "The dog just continued to not be cooperative." It then left that freeway and troopers, concerned that it would return, found it on a nearby street where the final encounter occurred. "Our troopers tried everything they could. We did finally get the dog out and he's going to be all right," Lee added. "He's just exhausted." 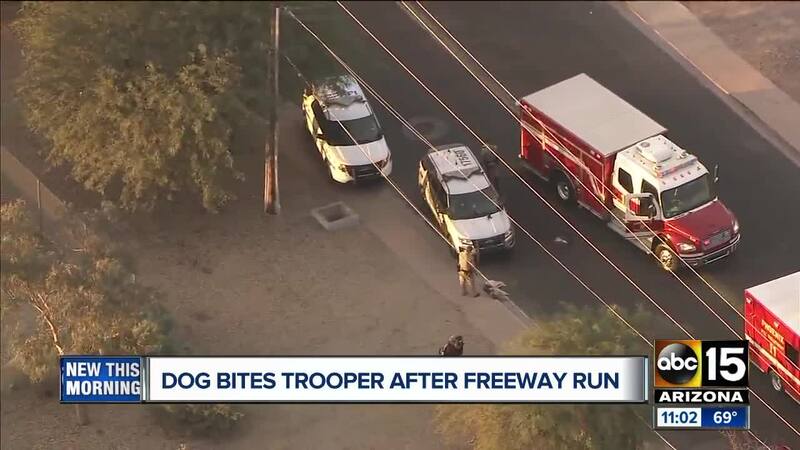 The dog later was resting comfortably and appeared to be healthy other having paw injuries "from running so much," said Jose Miguel Santiago, spokesman for Maricopa County Animal Care and Control. Santiago said the quarantine will determine the demeanor of the dog, which is about a year old, and see if it has any health problems. The dog will then be evaluated to see whether it should be put up for adoption or go to a rescue organization, Santiago said.